bespeaks that only 50% do. I see, though, that your chart is dated 2006. This shows how precipitously the numbers are declining, of those who believe in evolution. Soon, no-one will. I saw the monkey picture at the Economist online. I thought something needed to be said on the HB. And speaking of evolution, the news about this freakishly large, prehistoric snake captured my imagination yesterday (in a Darwinian way, not in a Jungian way). This was in Nature and has been picked up a few places. http://en.wikipedia.org/wiki/Titanoboa. That’s a lot of snake. Christopher, I find it hard to believe that fewer people over time are convinced by Darwin. Maybe it was a different way of polling? Then again, what do I know. Boy, what a trend that would be! Funny about that snake. I saw it, too, and went Jungian…. Looking at the picture, let’s decide which chimp we each identify with or most resemble at dinner time. (clockwise, 6 o’clock chimp has his head down, 12 o’clock is eating with her hands). 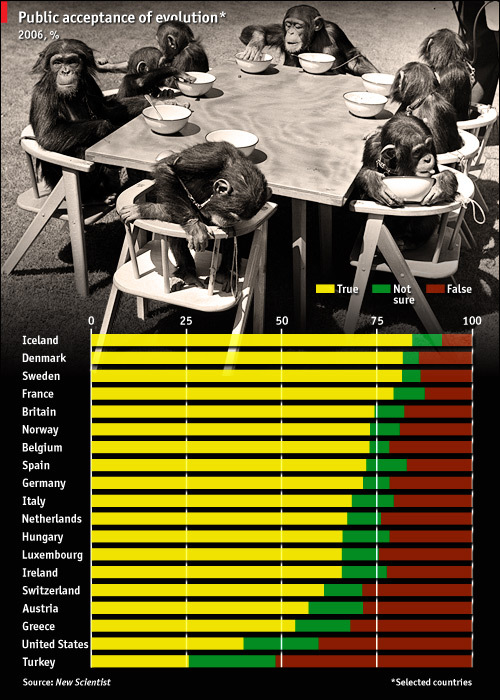 I like the chimp seated at 7:30 position. The Crotchetys definitely share a branch in the family tree with that one. Is it family tree or family wreath?